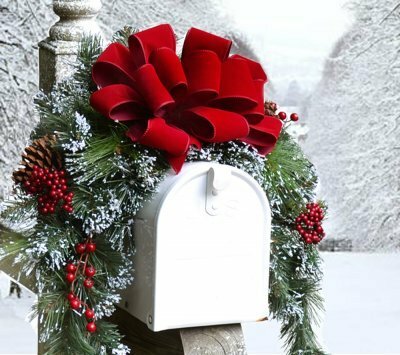 Have you thought about decorating your mailbox for Christmas? I love the Christmas season so we generally do some sort of Christmas decorating to our yard and home. Hanging lights can be a challenge since it means Marty or I need to find a ladder and then manage to string them all over the house. It’s much easier to decorate something smaller like your bushes, front door or your mailbox. This post contains affiliate links, and I will receive compensation if you make a purchase after clicking on my links. I think that outside Christmas decorations really just brighten up your yard and welcome your guests. With Christmas around the corner, I’d love to brighten up my mailbox a bit and make it a bit more festive to share some of my Christmas cheer. There are several ways to decorate your mailbox for the holidays that work well for standard mailboxes and modern mailboxes. Red Bows – One of the easiest ways to dress up your mailbox is by placing a red bow on the side. You’ll want to have two – one for each side. Please make sure to get weatherproof red bows. Otherwise, they will start to droop and look dingy after the first snowfall or rain shower. Mailbox Cover – You don’t need to be crafty to decorate your mailbox. 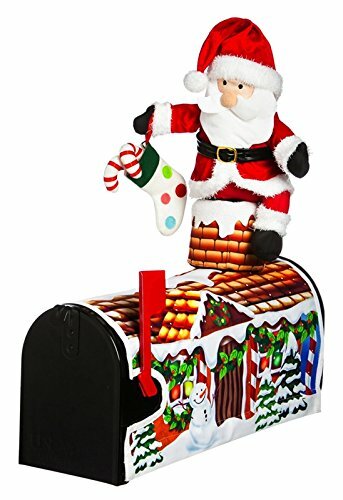 You can purchase a Christmas mailbox cover that has pine boughs, red ribbon, pinecones, and even lights. All you’ll need to do is to fasten it to your mailbox. If you are crafty, you can make your own DIY mailbox decorations. 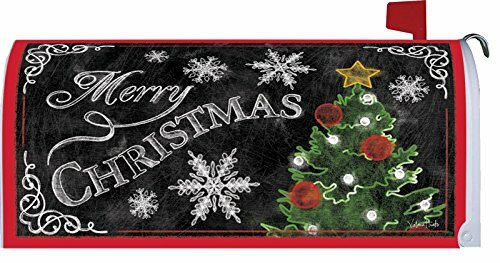 Magnetic Christmas Mailbox Covers – If you want something that will last a long time, a magnetic mailbox cover is a great choice. These covers make it look like your mailbox has been painted with a Christmas scene. But, they can easily be removed after Christmas is over. So, if you have a planter around your mailbox, you can replace the dead flowers with some festive pine branches, pine cones, and some outdoor safe red bows to give it some Christmas cheer. You can wind garland around the post as well although you may have to change it a few times depending on the weather. If you have electricity near your mailbox, you can wrap a string of outdoor Christmas lights around the post. And, if you’re talented with painting, you can paint some holly and berries or even a Santa Claus or Christmas stocking on your mailbox. If you’re not a talented painter, you can use the magnetic covers instead. Now, if you’re looking for something fun and funky, I’ve seen people attach sleighs to the top of their mailboxes. And, you could use caulk to attach it and then remove it carefully after the season is over. If you want something easy, a simple red paint job and a few pine boughs is perfect. Make sure whatever you do to decorate your mailbox that you can still open and close the door and raise and lower the flag when you’re done. Your mailman won’t appreciate it if your mailbox is impossible to open. So, any other thoughts on decorating your mailbox for Christmas? Want more Christmas decorating ideas? I love the idea of decorating the mailbox for Christmas as well as other key holidays!